Organization: African Cultural Alliance of North America Inc.
As Told to Good360 by African Cultural Alliance of North America Inc. The African Cultural Alliance of North America Inc. is a nonprofit organization based in Philadelphia, PA. ACANA serves African and Caribbean immigrants by providing access to social and legal services, community development programs, and health services. 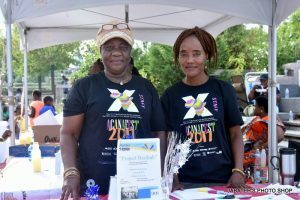 The group also organizes African arts and culture events along with an array of many other services. ACANA’s objectives are not only to assist new residents in their adjustment and resettlement, but also to help them become active participants in their new environments. In doing so, ACANA strongly believes in working with people of all backgrounds to build a better community. The mission of ACANA is to help refugees, immigrant families and all other residents of Philadelphia access legal, health and other social services with a special focus on women, children, men and the elderly in their resettlement process. ACANA also produces and presents African cultural performances and recording artists to create an awareness of African arts and culture. To this end, we strive to promote the preservation of cultural values as well as to support artists’ efforts to promote their own vocations in their new environment. This women’s clothing donation provided to women in a shelter program that positions women to better adjust to a new environment. African Cultural Alliance of North America Inc.